In this lab you will simulate using a giant magnetoresistive (GMR) sensor to measure the strength of the magnetic field B produced by a current flowing in a circuit. One section of the circuit is a long, straight wire. You will measure the strength of the magnetic field near the middle of this wire as a function of the distance from the wire, for distances much smaller than the length of the wire. You will also use Ampere's law to calculate the magnetic field strength B produced by a current flowing in an infinitely-long, straight wire (with the rest of the circuit at infinity). You will compare the results of your measurements with the results of your calculations. You will measure the magnetic field strength near a current-carrying long straight wire, as a function of the perpendicular distance from the center of the wire. You will verify that close to the wire and near its center Ampere's law can be used to make reasonable predictions, even if the wire is not infinitely long. You will learn about giant magnetoresistive sensors. Ampere's law applied to an infinitely-long wire predicts a magnetic field of strength B = μ0I/(2πr) a radial distance r from the wire. The field B is tangential to a circle of radius r centered on the wire. We therefore have (B/I) = (μ0/(2π))(1/r). B/I is proportional to 1/r, and when plotted versus 1/r will yield a straight line with slope μ0/(2π). 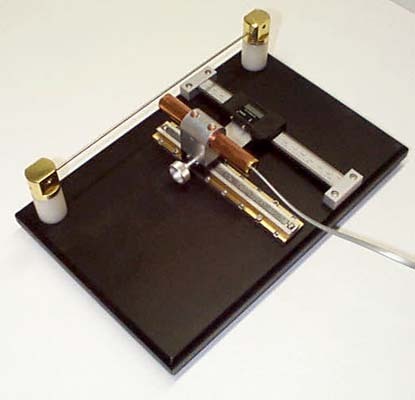 In this experiment you will use a GMR sensor to measure magnetic field strength. In a GMR sensor, the resistance of two thin ferromagnetic layers, separated by a thin, nonmagnetic conducting layer is altered by changing the magnetic moments of the ferromagnetic layers from parallel to anti-parallel or vice versa. Layers with parallel magnetic moments have lower resistance than layers with anti-parallel magnetic moments. The layers are typically less than 10 nm thick. They are sputtered onto semiconductor wafers and they are patterned into narrow stripes. A very small current flowing through the conducting layer across the stripes rotates the magnetic layers into anti-parallel, high-resistance alignment. An external magnetic field applied perpendicular to the direction of current flow and parallel to the stripes can overcome the field produced by the current and rotate the magnetic moments of both layers parallel to the field. The amount of current needed to destroy the alignment caused by the external field is a measure of the magnetic field strength. Smart sensors with sensing elements and associated electronics on the same chip can be bought. These sensors have a sensitive axis (along the stripes) and can directly detect the component of the magnetic field along this axis. The diagram below shows two GMR sensors positioned to measure the magnetic field of a bar magnet. The sensitive axes are indicated and the component of the field along the sensitive axes for the two sensors is plotted. The Ampere's Law apparatus is shown in the figure above. It is used to measure B as a function of the radial distance r from a wire, for r much smaller than the length of the wire. For this apparatus r is the distance between the center of the wire and the point at where the GMR sensor is located beneath the surface of its mounting package. The straight wire is 0.23 m long, and we measure the strength of the magnetic field near the middle of this wire as a function of the distance from the wire for r = 1.68 mm to 11.68 mm. The distance r is determined with a digital scale to a precision of 0.1 mm. Initially the top surface of the IC mounting package is positioned so that it touches the wire and the digital scale is zeroed. At this position, r = r0 = 1.68 mm. r0 is the sum of the radius of the wire (1.18 mm) and the sensor depth (0.5 mm). r0 must be added to all subsequent readings of the digital scale. To pass a current through the wire, it must become part of a larger circuit that includes a power supply. The distance from the sensor to the connecting wires is much larger than r, and so the magnetic field produced by the connecting wires contributes very little to the measured magnetic field strength. The magnetic field produced by the wire encircles the wire and its direction at the position of the sensor is perpendicular to the base plate. The sensor is mounted so that its sensitive axis is also perpendicular to the base plate. The output voltage of the sensor V is directly proportional to the magnetic field strength B to be measured if an appropriate offset voltage has been subtracted. The offset voltage is partly due to the earth magnetic field and partly due to sensor electronic. It must be determined before each measurement by reading the voltage when no current is flowing in the wire. The current is turned on and off with a switch. The current flowing in the wire is determined with a digital ammeter build into the power supply. The power supply is set to current mode, and when turned on delivers a current of 10 A. The output voltage of the sensor is determined with a digital voltmeter. Open a new Excel spreadsheet and create a data table with columns as shown below. The labels denote the following quantities. B/I = kΔV/I with I = 10 A. Start taking data. Click the switch to turn the power supply on or off. As a function of r measure V0 (no current) and V (current) in quick succession, so that the offset voltage has very little time to change. Record d, V0, V, and I in your data table. Take data in 0.2 mm intervals for scale readings from 0 mm to 10 mm. Compute the remaining columns in your data table. Produce a graph of B/I versus 1/r. Use the trendline to fiit your data to a straight line and find the slope and the intercept of this straight line. Make sure the fitted values are displayed with at least 3 significant digits. Insert your table and your graph into your Word document. Ampere's law predicts a slope of μ0/(2π) = 2*10-7N/A2. Compare your measured value with the accepted value. Find the percentage difference. Note: Because B is inversely proportional to r, the field strength is largest and changes most rapidly as a function of r close to the wire. As a result the measurements near the wire dominate the analysis. Add an extra column to your spreadsheet, (slope*(1/r) + intercept). Add a column calculating the percentage difference (straight line value - measured value)/straight-line value. For which data points is the percentage difference (straight line value - measured value)/straight-line value largest? Over what range of distance from this finite-sized wire do you feel comfortable using Ampere's law to predict the magnetic field strength? Save your Word document (your name_lab7.docx), go to Canvas, Assignments, Lab 7, and submit your document.